This 8 Day Cape Town Zululand Safari Package is a shorter but an incredibly worthwhile safari package highlighting the best that the two areas have to offer respectively Cape Town and Zululand. This 8 day package includes Cape Town Table Mountain, Wine Tasting in Stellenbosch a visit to the Cape Town Waterfront and then travel to Durban from where you will travel to St Lucia, South Africa’s first world heritage site. It is from here that you will go on various safaris including Night Drive Safaris, Big 5 Safaris, Boat Safaris and more. Zululand is after all bush country with incredible scenery and tropical beaches. This 7 Day Package highlights some of the most incredible sights while in both Cape Town and Zululand. Join us and experience the metropolitan Cape Town and just why this city has been voted one of the top cities in the world then travel to true African bush country Zululand where the wildlife still roam freely. Meet and greet at Cape Town International Airport, travel to your accommodation then you are off to the VA Waterfront included on this outing is a trip to Robben Island. After breakfast we depart for a full day’s outing around the majestic Cape Peninsula, included is Bantry Bay, Camps Bay, Hout Bay and Sir Lowries Pass its all about magnificent scenery and delectable tastes. After breakfast we depart to Stellenbosch for some amazing wine and cheese pairing at various wine estates. Breath-taking scenery and incredible wines await. Today you will have some free time and discover historical areas of interest included is the house of parliament and botanical gardens. You depart today for Durban International Airport, meet your guide and discover Zululand as you are transferred to St Lucia the only town where Hippo’s still roam freely at night. Get checked into your accommodation and no sooner are you off on a Sunset Boat Safari, witness Hippo’s, Nile Crocodiles and an abundance of Birdlife. The evening is spent wandering through the African Bush as you on a Night Drive Safari, keep an eye out for Leopard, Buffalo, Elephant and much more. A early start to the day begins at 5:00am as your ranger will be ready to take you to the oldest proclaimed reserve in Africa the Hluhluwe Umfolozi Game Reserve as you go insearch of the African Big 5, Cheetah and Wild Dogs to mention but just a few of the possible wildlife encounters. A later start today 8:00am you will be met by your ranger once again and depart into iSimangaliso Wetland Park for a half day bush & beach safari, witness why this area was proclaimed a world heritage site. After which we unfortunately say goodbye and you are transferred back to Durban International. 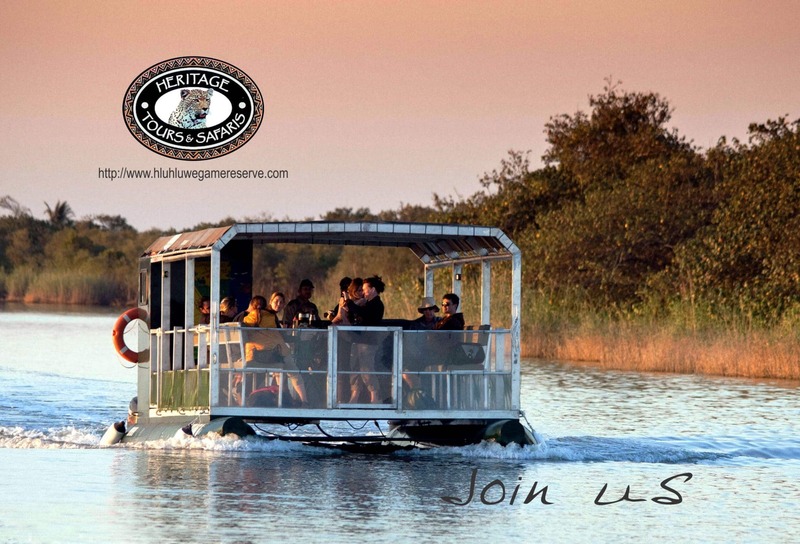 Heritage Tours & Safaris cordially invites you to discover South Africa on this magnificent 8 Day Safari Package, any safari to Africa is a once in a lifetime opportunity and we aim not to only meet your expectations but to exceed them. Various add on’s may be added to this package should you feel that we have left something out that you would like to see or do. The friendly and experienced staff, guides and rangers invite you to experience our South Africa.